This article contains the skills, stats, strategy, and ability of Hassan of the Cursed Arm of the Assassin class from Fate Grand Order [FGO]. If you want to see Hundred-Faced Hassan, click here. If you want to see Hassan of Serenity, click here. If you want to see King Hassan, click here. 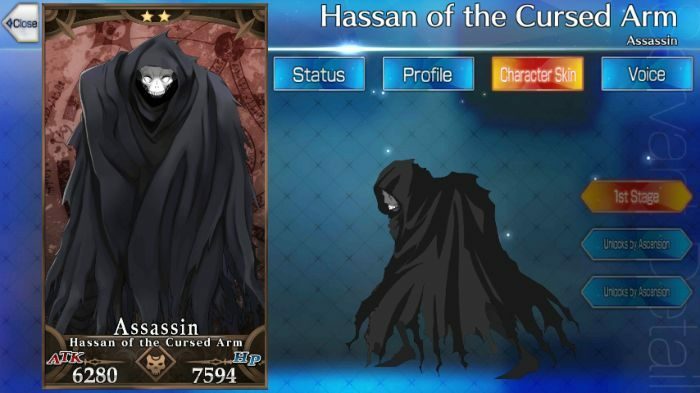 Hassan of the Cursed Arm, despite being a 2-star Servant, still proves to be both a durable (through evasion) and strong Quick-based attacker. However, though he is strong in one-on-one combat, he struggles against waves of enemies, and will need proper support. With 3 Quick Cards, 1 Buster, and 1 Arts, Hassan is at his best generating C. Stars and dealing critical hits. For skills, Protection Against the Wind combines both defense, in the form of evasion, and damage, in increasing Hassan’s C. Star generate rate. Thus, it’s best to prioritize leveling up that skill. Self Modification is a good skill to level up afterward, because you can expect a lot of critical hits from him. Hassan’s Noble Phantasm, Zabaniya, is incredibly powerful, dealing 2000% damage at max level, and this is very easy to achieve because he is easy to obtain, even from Friend Point Summoning. On top of this, even if the enemy survives, it still has up to 120% chance to Insta-kill. Marie Antoinette is a very good teammate for Hassan. She covers his weakness to Caster-type enemies, first of all. Also, with 2 Arts Cards and 2 Quick Cards, they can very easily make Quick Chains, while she can also help trigger Arts Chains to charge their NP gauge. She also has invulnerability in the form of Beautiful Princess, which means survival is not as much of an issue for the pair. Her charm skill, Siren Song, helps manage crowds of enemies. Her Noble Phantasm, Guillotine Breaker, targets all enemies, and has the added support effects of removing debuffs and healing HP for the party. For his Craft Essences, Hassan wants either Quick card performance boosts for his attacks, or NP gain to quickly get Zabaniya. Imaginary Around boosts Quick card performance by 25-30%. Gandr and The Verdant Black Keys are weaker alternatives, but they’re easier to obtain. Divine Banquet gives 25-30% boost to NP Generation, while Kaleidoscope is a more immediate 80-100% NP Charge at the start of the battle. Hassan has a lot of skills to generate C. Stars and increase his critical hit damage, but none for absorption. Thus, Sealing Designation Enforcer helps boost his C. Star absorption greatly, to ensure that they all go to him. This way, he can make the most out of the C. Stars he generates. Throw (Dagger) B – 6 Receive critical stars. Self-Modification A 3 7 Heightens self’s critical damage. Protection Against the Wind A+ 3 7 Applies self evasion. Deals damage to a target. Chance to Insta-Kill The Target. Otherwise known as the “Assassin of the White Skull.” Hassan of the Cursed Arm is the head of the assassination cult, where its roots originated from the Middle East. Alternatively, he belongs to a generation of experts each of the 18 are referred to as the “Old Man of the Mountain,” with one expertise tied to each member. His intentions are unknown, however he is described as a faithful disciple of the lord, and will follow without question. Hassan of the Cursed Arm has no qualms on fulfilling his assassination duties since he treats it as an objective given to him. He neither feels anything after performing the assignment. As a Heroic Spirit, he respects the social order, and performs phenomenally as a servant to his Master.